Opportunities to get results are starting to run out for City. Can Neil Warnock pull off a miracle and keep the Bluebirds up? Phil Bardsley is a major doubt for Burnley's Premier League clash with Cardiff at Turf Moor on Saturday after suffering a freak injury. The right-back missed last weekend's victory over Bournemouth after cutting his leg on a table tennis table - Matt Lowton impressed in his absence, so is set to keep his place. Striker Peter Crouch may not play again this season after undergoing appendix surgery, while winger Aaron Lennon (knee) and midfielder Steven Defour (calf) also remain sidelined. Harry Arter is a doubt with an ankle injury, but Jazz Richards is in contention following a hamstring problem. Long-term absentees Callum Paterson (ankle), Sol Bamba (knee), Alex Smithies (knee), and Matthew Connolly (ankle) remain out. Burnley haven't lost a home game against Cardiff since May 1988 (1-2), winning six and drawing eight since then. 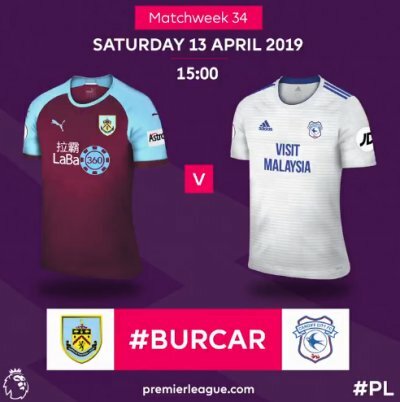 Cardiff haven't lost consecutive matches against Burnley since the 1999-00 campaign in the third tier. Burnley manager Sean Dyche has never lost against Neil Warnock, winning four of his five matches against the Cardiff boss (D1). Burnley have won their last two Premier League games, each by a margin of two goals. The last time they won three in a row by 2+ goals in the top-flight was back in October 1968 (a run of four). Cardiff have lost five of their last six Premier League games (W1), with a victory against West Ham the only exception in that run. Burnley have lost just one of their last 14 Premier League games against sides starting the day in the relegation zone (W7 D6), though that loss was earlier this season - against Fulham. Burnley's Ashley Barnes has had a hand in four goals in three league starts against Cardiff (three goals, one assist), although his last goal against them came back in March 2012. Cardiff's Victor Camarasa has scored two goals in his last three Premier League games - as many as he'd netted in his previous 21 in the competition. Ashley Barnes has scored 10 league goals for Burnley this season - only Danny Ings in 2014-15 (11) has netted more in a single Premier League campaign for the Clarets. Cardiff's nine away league goals this season have been netted by eight different players, with Sol Bamba the only Bluebird to score more than once on the road.